Two goals in three minutes by Will Bruin propelled the Sounders into the playoffs Sunday. Seattle can guarantee a first-round bye with a win in the regular-season finale. Two goals in three minutes from forward Will Bruin clinched a ninth consecutive playoff berth for the Seattle Sounders Sunday at the Clink. 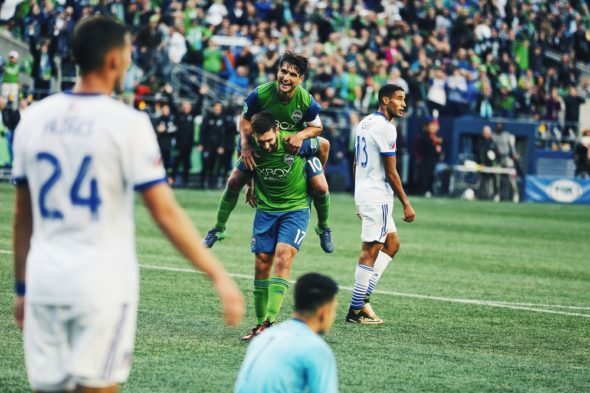 The 4-0 win over FC Dallas was the second victory in the last eight matches, moving Seattle into third place in the Western Conference standings. The Sounders can finish the regular season no higher than second nor lower than fourth. Bruin’s scores were his first since Aug. 5. The goals brought his season total to 10, the fourth time in his career that he struck twice. Victor Rodriguez started the scoring in the 31st minute, when Clint Dempsey slipped a through ball through the right side of the back line to find the Spaniard at the 18-yard line. Rodriguez went one-on-one with Dallas keeper Jesse Gonzalez and finished the ball past him. Bruin struck just past the hour mark. In the 64th minute, Dempsey rocketed a shot off Gonzalez, and Bruin powered the rebound into the unprotected net, dragging defender Atiba Harris five yards in the process. Three minutes later, Rodriguez ran onto a loose ball inside the area but had it poked away. As the ball rolled away from goal, Bruin smashed it into the net to all but guarantee the victory and start an early celebration for the 48,478 in attendance. Bruin offered his side of his interaction with Schmetzer. The final score came when Lamar Neagle smashed in a header on a cross from Nicolas Lodeiro from the right alley with the final touch of the game. It capped off Seattle’s third four-goal performance of the season. The shutout was Stefan Frei’s league-leading 12th, a franchise record. Schmetzer said Frei deflected credit for the feat. The result pushes the MLS defending champions (13-9-11, 50 points) to third in the west behind Vancouver (15-11-7, 52 points) and Portland (14-11-8, 50 points), which owns the tiebreaker (MLS standings). The other two Cascadia clubs play each other on the final day of the regular season Oct. 22. It is impossible for Seattle to win the west, due to Vancouver’s lead in the first tiebreaker, most wins. A Seattle win in its finale Sunday at home against 10th-place Colorado, regardless of the Portland-Vancouver match, would secure second place and one of the four first-round byes in the playoffs. Bruin summarized the night in the context of the playoff picture. I am suddenly happy! The regular MLS season provided a lot of uhhh, interesting turns. I admit to pessimism but get “giddy” with happiness on occasion. ..a bit bipolar? or just feeling every emotion with every game. On the radio pregame, they said Will Bruin needed to have a big performance. I’ll say he did. Good win to go for the jugular against a team reeling in confidence. I also love how MLS uses wins, not goal difference, as its first tiebreaker. Encourages more teams to push for the full three points and not sit back for ties. It also eases up on the in-game math about goals on the last day. Wish the European leagues would give this a try.